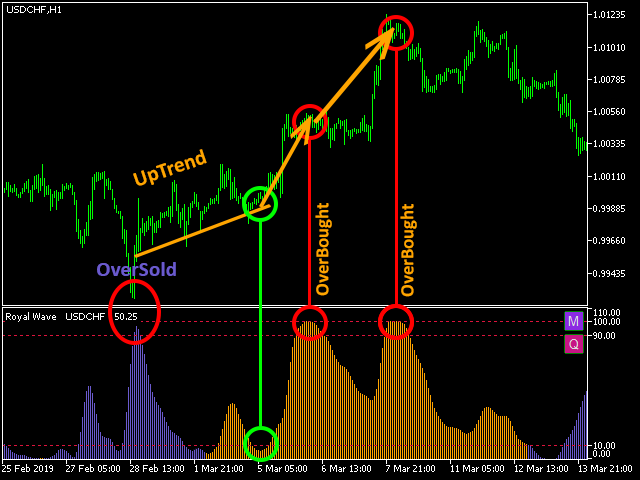 Royal Wave is a Trend-Power oscillator based on a price adaptive algorithm that runs dynamic statistical analyses on the price movement to predict and locate low-risk entry zones and exit zones. Its rich alerting system generates well-timed trading signals that give the trader enough time to make proper logical trading decisions. Once the oscillator value is about zero it means there’s going to be a big movement in the price in the near future because traders in most timeframes are agreed on the current price and have united to move the price by a big step in one direction. Therefore Royal Wave tries to predict low-risk entry zones where price wants to move only in one direction until the oscillator reaches the exit zone. Entry zones are always going to be the close enough start of a big movement in the price. 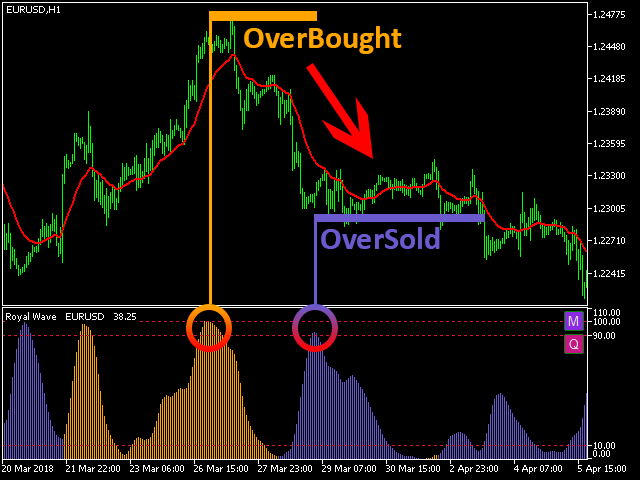 Once the oscillator is in the exit zone close to 100, it’s predicting an overbought when the color is yellow or an oversold when the color is blue. This zone can be used to exit a trade or update a stop loss level because of the high probability of reversals in these areas. Exit Zone points are potential candidates to be global reversal points in a trend. By using the Royal Wave Signal Matrix, some of these areas can be identified as low-risk areas to enter a reversal trade. The value of the oscillator represents the current power of the trend which oscillates between 0 and 100. When the power is rising, a yellow color indicates a strong uptrend and a blue color indicates a strong downtrend. A decreasing power shows consolidation which means there is no trend in the price and the trader should wait for the entry zone. Gives an informative view of several symbols vs all timeframes in one matrix. Each cell of this matrix is a brief representation of a symbol’s price behavior from a single timeframe. See and compare data from an arbitrary symbol and timeframe within a chart with a different symbol and timeframe. 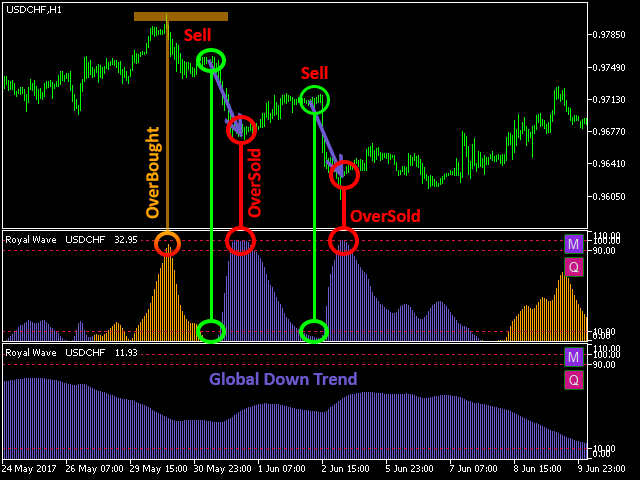 This tool can be used to develop multi-symbol and multi-timeframe strategies. Alerting functions, Signal Matrix, and Cross Window might not work in the test process properly. it's the MetaTrader restrictions for playing sounds and drawing objects in the strategy tester. Symbol Text Current The indicator symbol can be different from its chart symbol. 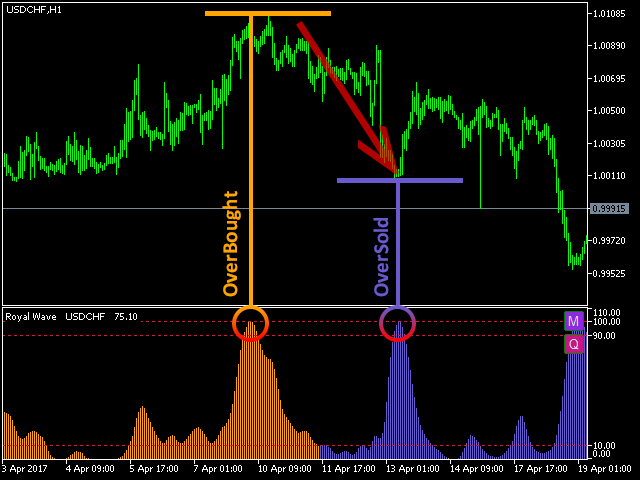 Sensitivity 0.0 to 1.0 0.6 Makes the oscillator sensitive to local price movements. The closer the value is to one, the more sensitive the oscillator is to the price movements. To catch longer trends and for noise canceling increase Alpha and Beta. 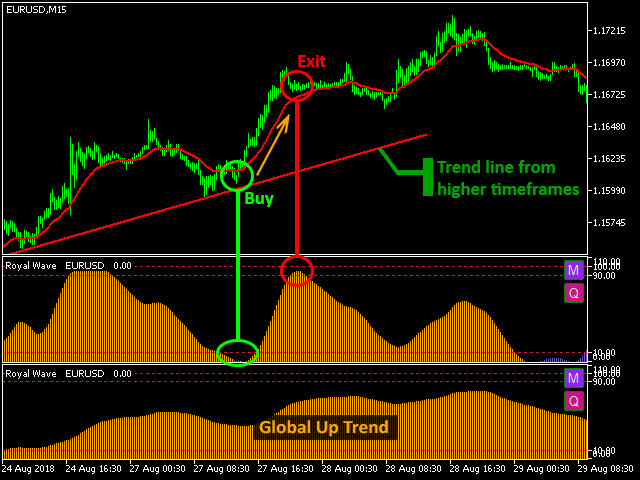 To get a global conformation for the trend you can add a second Royal Wave with higher values of Alpha and Beta. Smooth Period 1 to … 5 Makes the signal smoother. Enter 1 if smoothing is not required. Zone Width 0 to 50 10 The vertical distance between both pairs of zone lines. All alerting functions depend on this parameter. Histogram True/False True Draws the oscillator as a histogram if true or a line if false. Entry Zone and Exit Zone sound alerts. By flashing the zones attracts the trader attention to the proper chart which potentially needs some trading actions. Sends notifications about trade zones to the trader’s phone. Exit Zone Only Enable Shows zone levels on the chart based on the Zone Width parameter.